Spring is officially here, and we couldn’t be more excited about it being one of the most wonderful times of the year to experience Gettysburg and Adams County! The start of a new season is the perfect time to make plans to get out and experience something new, so we welcome you to the beautiful sights, sounds and experiences of Gettysburg this spring. Take a breath of that fresh spring air, grab a notebook and start planning your way through these ten inspiring experiences to add to your bucket list! Gettysburg, Pennsylvania is an excellent destination for families with kids. The area offers a small-town feel, yet boasts a large variety of experiences that both parents and kids can enjoy. 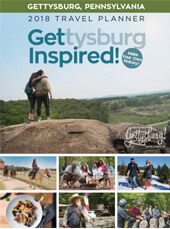 Gettysburg, Pennsylvania is an incredible year-round travel destination. Not only is the area home to a premier ski resort, there is such a variety of things to choose from to create an amazing winter getaway. Whether you’re looking for active winter fun, a foodie getaway or just some great relaxation, make the Gettysburg area your winter getaway destination. Take a look at the list below for eight amazing things to do this winter in Gettysburg. Sometimes in life, you want fresh and healthy food, and sometimes you want straight up comfort. This list is for the latter, for when you are looking for an indulgent, warming and comforting bite to eat. From soups to sandwiches, from shareable appetizers to classic comfort dishes, check out the list below for some of the most delicious comfort foods in Gettysburg. The holiday season is here, and if you are hoping to find that warm and cozy holiday feeling, Gettysburg is the place to be. Gather your family and friends and plan a December getaway to Gettysburg to experience all that the holiday season has to offer. Here are ten ways to get in the holiday spirit in Gettysburg! Gettysburg, Pennsylvania offers such diverse experiences that draw a variety of travelers to the area. From foodies to history buffs, from outdoor lovers to the family traveler… there is a little bit of something for everyone. With so many options on things to do, we thought we’d help you narrow it down based on how you prefer to travel. Take this quiz to find out what kind of traveler you are, and based on your results, we’ll give you some recommendations on things to do while visiting the Gettysburg area. There is an abundance of ways to tour Gettysburg National Military Park. Each place visitors at unique vantage points and provides different perspectives of the three-day battle throughout the 6,000-acre park. But often it’s the pace that can make the biggest difference, and that’s no more noticeable than by tackling the hallowed grounds by foot. While there are trails at Gettysburg National Military Park that some would consider a good hike, much of the battlefield’s pedestrians pathways are more in line with walking than hiking.